The interior finish of your inground swimming pool is comparable to the icing on a cake: Both serve as the finishing touch that covers the entire structure and helps define its overall aesthetic. Indeed, a great deal of planning, effort, and material selection goes into building a concrete (gunite or shotcrete) pool. But regardless of the pool’s design and decorative features, the interior finish transcends the complete design and plays a major role in how attractive your pool is. Pool builders apply the finish to the concrete shell of an inground pool’s shell. The material’s purpose is for more than visual appeal; it’s critical for making a pool interior both smooth and waterproof. Whether you are choosing the finish for a brand new pool or need to resurface the aging plaster on your existing one, it’s important to evaluate which kind of material to use. Each comes with its own set of pros and cons for in areas such as cost, visual appeal, and durability. Carefully assess the options for your pool’s “cake frosting.” The three primary finishes available for a new pool or a “replaster” job are marcite (traditional white plaster), colored quartz aggregate, and pebble. Let’s take a look at what each kind of finish brings to the table. That way, you can make the best choice for your needs and preferences. Used for decades in hundreds of thousands of pools around the globe, marcite is the material most commonly used for plastering a pool. In fact, many people use the term “marcite” and “plaster” interchangeably. Marcite is a mixture composed primarily of white Portland cement, marble dust, and fortifying additives to boost strength and water resistance. Mixed with water, it forms a smooth material that specialty crews use to coat the inside of a pool. They apply it over the concrete surface with hand-held trowel tools to create a smooth, hard exterior. Marcite is also the most affordable option for a new pool or replastering an existing one. 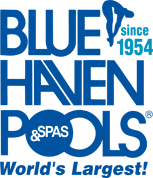 With properly maintained pool water, it will last 8 to 12 years. However, in regions with particularly “hard water” (water with high alkalinity and calcium), the pool water wreaks havoc on marcite’s endurance. In these cases, quartz or pebble is almost always a smarter choice. Although marcite starts out as white, the wet mix can be dyed in a small range of blues and greys to create a dark-bottom pool, which is popular for lagoon-style designs. However, the deeper the added color, the more easily the finish will show imperfections, such as streaks and fading. In fact, some pool builders are reluctant to use dyed plasters because they almost magnify any minor blemishes. Because marcite constantly reacts to chemicals, minerals, and the pH/alkalinity in pool water, this kind of finish is more susceptible to problems if your water chemistry is not properly and consistently balanced. Consequences can include staining, etching, mottling, erosion, and discoloration. It’s hard to overstate just how pivotal the role that water quality plays in extending—or shortening—the life of a marcite finish. Because of its increased vulnerability to visual blemishes and its requirements for stringent water quality, marcite deteriorates faster. Bottom line, it’s the pool finish that will get the job done—but do so with the least durability and the shortest lifespan. That’s why more and more pool buyers and pool owners are rethinking the use of marcite. Instead, when they are picking out materials for a new pool or refinishing their current one, they upgrade to colored quartz aggregates or pebble finishes. Originally pioneered by the 3M Company back in the Nineties, quartz aggregate blends have become a favorite in the pool-construction industry for their desirable attributes. Several companies manufacture this material that plaster contractors around the United States have used in thousands of inground pools. A quartz interior pool finish consists of a marcite base with silica and quartz aggregate mixed in. The aggregate is composed of small quartz granules that have been mechanically tumbled into roundish shapes. The quartz pieces have colored ceramic pigments permanently bonded onto their surfaces for a tough, beautiful exterior. Pool plaster contractors apply this quartz blend to the interior of a pool shell in the same manner used for plain marcite plaster. While the application process is the same, the final results are not. Quartz finishes deliver greater strength, beauty, and resilience to any inground pool’s interior. For starters, quartz falls on the higher end of the Mohs scale of mineral hardness. That makes it difficult to scratch, and it resists chipping and etching better than marcite. Used as a finish in a new or renovated pool, quartz creates a strong, nonporous, stain-resistant interior. It also performs longer and more effectively at fighting erosion caused by chemical imbalances in pool water. Besides providing increased durability and functionality, quartz delivers big on the style front. Quartz blends come in a broad spectrum of colors, including blues, reds, whites, greys, tans, and teals. Once applied, the finish exudes a lovely speckled pattern inside your pool that you’ll enjoy gazing at from near or far. And if mild stains or etching eventually develop over the years, the speckled patterns help disguise the visual blemishes far better than plain marcite. Advantages like these make quartz finishes popular with homeowners and pool builders. With all that they have to offer, quartz blends cost more upfront—roughly 20 to 30 percent over the cost of plain marcite. However, they almost always produce a superior investment because they beat marcite’s endurance—typically by 10 to 15 years—providing greater value over time. Inspired by the tiny stones you see in some river beds, pebble is the high-end pool finish that ensures the greatest beauty and the highest durability of all three finishes. It produces a truly distinctive result that enhances any pool. Because of its composition, it is virtually impervious to chipping, mottling, staining, or fading. This enduring pool surface is created from a mix of marcite plaster and pebble aggregate. Pebble blends come in three sizes; all are very small, with the smallest being a bit larger than a grain of sand. The textures vary too; some blends with larger stones may be a bit rough compared to quartz blends. When picking out a blend, keep the comfort factor in mind: You may not like how some pebble blends—those with larger sizes and certain textures—feel on bare skin. Some even leave temporary pock-like indentations on your skin if you sit a while on a pebble-covered step or tanning ledge. Like quartz, pebble finishes are available from some manufacturers and come in a variety of factory-mixed, pre-bagged colors. For this reason, the colors run uniform, and if a repair is ever needed down the road, achieving a near-perfect color match is easier. But unlike marcite and quartz, the application process is more labor-intensive. 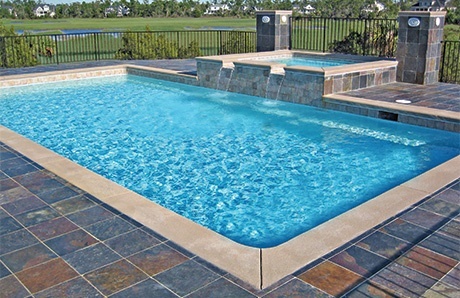 Pebble-finish pools typically require separate visits on different days from the plaster crew. With a wide variety of colors available, pebble finishes can be used to create a stunning aesthetic. You might consider using pebbles to evoke the imagery of a lake bed, mountain stream, or some tropical vacation spot you once visited. Pebble surfaces are luxury upgrades that require a bigger budget than marcite and quartz aggregate. Expect to pay about 45 to 60 percent more than marcite. In fact, for a medium-sized, 20,000-gallon pool, figure on it adding at least two to three thousand dollars to the finish cost. In some regions of the country, the dollar increase may be even more. However, a pebble finish is gorgeous, and it will typically give you 12 to 14 years of handsome good looks. So, in the long run, a pebble finish may be more economical to maintain. Whether you’re planning to build a swimming pool or update an existing one, you’ll face a decision on what kind of interior finish to use. Three are available for a range of personal budgets, and when you make a choice, it’s important to weigh factors such as the appearance you would like and the performance you want. Marcite is the most common, low-cost option with the least durability and greatest tendency to show all forms of blemishes and wear. But consider moving beyond old-school marcite. Upgrades to quartz aggregate and pebble finishes will require higher initial budget outlays. However, as discussed here, they provide wider color and style options, make a pool more attractive, and go the distance for resisting and hiding a variety of blights. Above all, they help postpone the cost and hassle of replastering your pool for many years. If it fits your budget, a new or renovated backyard resort with upgraded finishes will reward you with extra years of pleasure in a more visually appealing aquatic playground.